Muheem McCargo led Woodrow Wilson to 42-14 win over Delsea in South Jersey Group 3 semifinals. On a slick, muddy field that had been pelted all day by a hard rain, it figured that a bruising ground game would make the difference in Friday night's South Jersey Group 3 semifinal. The twist was that the damp night's dominant running attack belonged to Woodrow Wilson. And that wasn't the only twist on this breakthrough night for the visitors from East Camden. With junior Muheem McCargo and senior Jahdir White combining for nearly 250 yards and three touchdowns, Woodrow Wilson stunned Delsea by a 42-14 score at John Oberg Field. "Nobody," Woodrow Wilson coach Preston Brown said, "expected us to run." With the victory, third-seeded Woodrow Wilson (8-2) advanced to the sectional title game for the second year in a row. The Tigers will face the winner of Saturday night's other semifinal between top-seeded Burlington Townhip and fifth-seeded Timber Creek. If Burlington Township wins, the title game will be hosted by the Falcons likely on Friday night. If Timber Creek wins, the title game will be at Woodrow Wilson's Mike Rozier Stadium, likely on Saturday afternoon. "That's what we're playing for, to get the championship,'" McCargo said. The victory popped the cork on an emotional celebration for the Tigers, who had lost three times to the Crusaders in the previous 13 months. That included a 56-14 setback in East Camden on Oct. 20 as well as a 29-28 setback in last year's South Jersey Group 3 final at Rowan University. But the Tigers turned the tables with a complete performance that also included big plays in the passing game, a kickoff return for touchdown and strong work from a defense that had been dominated by Delsea less than a month ago. "We reversed it on them," said McCargo, a hard-running junior who gained 155 yards and scored two touchdowns on just 12 carries. McCargo went for 147 yards and both scores in the first half, as Woodrow Wilson built a 22-8 lead. 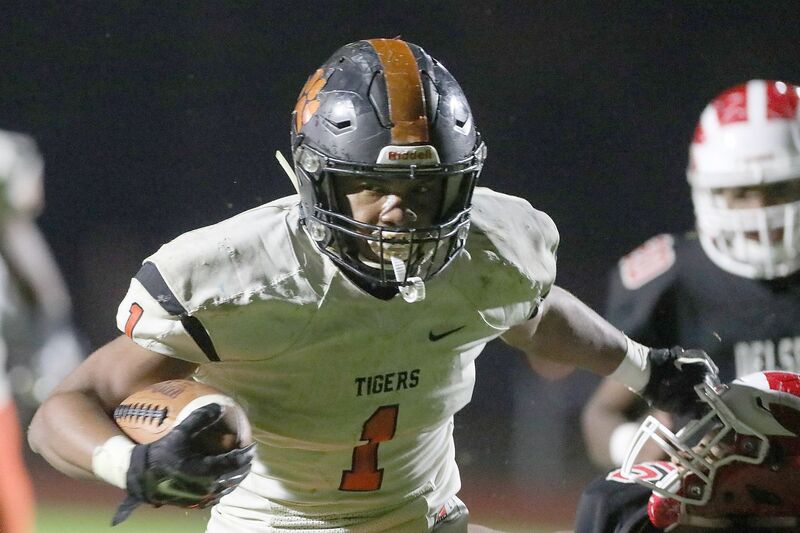 When Marquay Graves serpentined across the field and returned the second-half kickoff 77 yards for a touchdown, Woodrow Wilson's lead was 28-8 and the Tigers were in complete command. "I just had to get in the end zone," Graves said. "To celebrate with my teammates, it was the greatest feeling." Woodrow Wilson quarterback Nick Kargman, who leads South Jersey in touchdowns passes with 34 and yardage with nearly 3,500, attempted just 11 passes on a cool, misty night. Kargman completed five for 101 yards, including scoring passes of 26 yards to Stanley King and 31 yards to Naiem Simmons. Delsea (6-4), the No. 2 seed that had won five in a row, jumped to an 8-0 lead as quarterback Damir Lomax went 63 yards for a score on the game's third play. But that was the highlight for the Crusaders, as Woodrow Wilson's defense contained the home team's vaunted ground game. "We knew we had to stop No. 7 on the dive," Brown said of Delsea senior Aidan Borguet. "He's a phenomenal back in their system. We knew if we could stop him, we could put them in difficult situations." Middle linebacker Fadil Diggs as well as King at outside linebacker and tackle Chase Little led the Woodrow Wilson defense. Playing in his final game, the Harvard-bound Borguet carried 27 times for 177 yards and a score. But 77 of those came on one carry with Woodrow Wilson holding a 42-8 lead midway in the fourth quarter. "We were embarrassed the last time," Brown said. "They scored 32 points in the first quarter – that's the worst quarter of my career. "We must have watched that tape a dozen times." McCargo's running helped the Tigers take control in the first half. He scored on a 19-yard run for a 14-8 lead late in the first quarter and added a 72-yard touchdown for a 22-8 lead with four minutes to play before halftime. "I have to give it up to my line," McCargo said. "They nailed it down." The victory set off a celebration on the Woodrow Wilson sideline. The Crusaders had been the Tigers' nemesis in the last two seasons, and the prospect of going 0-for-4 against the home team was a daunting proposition for the squad from East Camden. "My blood was boiling," Brown said. "I told the seniors my legacy was on the line too because I never beat Delsea. "But this isn't the end for us. We didn't just want to beat Delsea. We want to win a championship."